Magicians always have been an integral part of our childhood. Majority of us have marveled at the illusions created by these masters of deceptions. With the modern times, these showmen have now become an extinct race. There was a time when magicians like Houdini were mega stars but now magic has turned sour. Now today nobody is really interested in watching a magic show or witness the feats of these entertainers. So is it the time to say farewell and let these mysterious creatures go unnoticed into the chronicles of the history? Perhaps not yet, because now there is a new illusionist in the town and he is known as Fantasini Master of Mystery. This magician par excellence is not only providing his magic tricks but also giving away great rewards. Fantasini Master of Mystery slot game is a five reels and 243 ways to win slot by Net Entertainment. As you may have already guessed that the storyline of this slot game revolves around Fantasini, a magician. The reels and rows of this game are in 5×3 format. The five reels are encased in a golden frame with shadows of spectators forming the background. The design of this game can be classified as digital blocks without any form of encasing for the symbols. 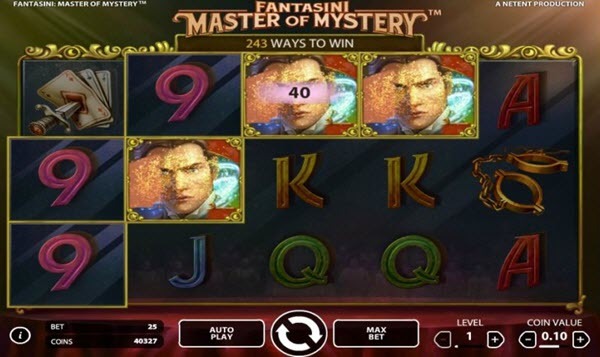 Fantasini Master of Mystery slot game is a very simple game without any extra bonus features. The wins of this game are payable by landing matching symbols in any position on three or more adjoining reels. The winning combination starts from the leftmost reel and ends at the rightmost reel. 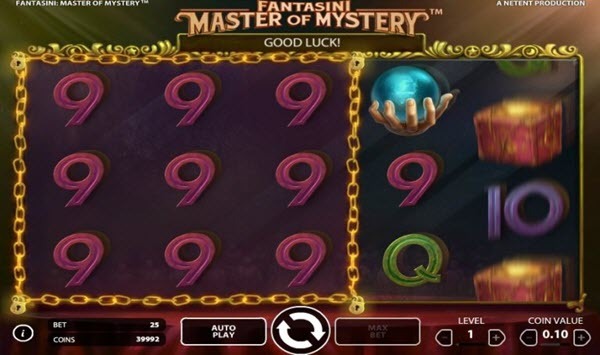 Fantasini Master of Mystery slot game comes with a fixed jackpot of 1000x along with the other usual features which include auto play and wild symbols. This slot does not provide any type of re-spins, free spins, multipliers, scatters or gambling option to its players. The coin limit for this game stands at twenty five coins and there are ten bet levels. The coin range starts at £0.01 and goes all the way up to £0.50. Landing five of these symbols on an active pay line awards 1000 coins. The J, 10 and 9 symbols provide the lowest payouts with maximum of 40 and minimum of 4 coins. Scatter Symbol: Fantasini Master of Mystery slot game does not provide any scatter symbols. Wild Symbol: Fantasini himself is the wild symbol of this game. It can be substituted for all symbols with an exception to scatter symbols. This symbol can randomly appear on the reels and helps in creating winning combinations. Fantasini Master of Mystery slot game comes with one bonus round called Twin Reel Feature. Twin Reel Feature: Each spin of this game starts with an identical and adjacent twin reels which are linked together. During the spin, the twin reel can expand to form third, fourth, fifth or even sixth adjacent reel. In simple words, the linked reels can expand to form a triplet, a quadruplet or a quintuplet reels. At the beginning of the spin, the identical reel can appear next to any of the five reels. The number of reels that are linked together is random and occurs independently for each spin.